Out with the old, originally uploaded by mistersnappy. 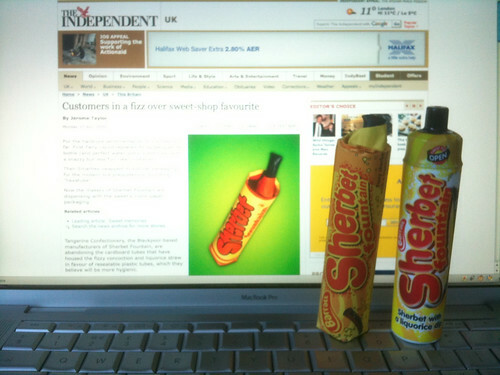 I’ve visited my local Sherbet Fountain supplier to find that they are one tube short of finishing their supply of old skool Sherbet Fountains, so I took the opporunity to purchase one of each to compare and contrast the experiences. On hearing the news that Barrat were dropping the paper tube in favour of plastic packaging I, as well as the whole confectionery eating world, was in shock. Although I have had the last few months to get used to the idea, I can tell you that when I saw the offending (offensive) packaging in the store today I was a little perturbed. You can see from the photo that side by side the classic paper packaging has a more tactile and slightly less uniform look to it. Part of the fun of buying a Sherbet Fountain was picking the one with the right length liquorice stick. Not too long, not too short… or was that just me? I have just opened the last of the paper tubed Fountains and pulled out the liquorice stick, which, for the first time in a long time, stuck to the yellow paper. But that aside, the experience of freeing the liquorice from the tube brought childhood memories flooding back. I then stuffed the whole stick in at once and savoured the moment as it started to melt away in my mouth. Then I chewed it and swallowed the lot! After a little moment it was time to make a start on the main attraction, a tube of sherbet. This requires the careful opening of the yellow paper to reveal the sherbet inside and a gentle squeeze to free it up and make it easier to pour into your gob. I opened and tore and found that the sherbet flowed freely while my mouth made the paper edges slightly soggy so that the sherbet stuck to the edges, making it resemble a cheesy 80’s style champagne cocktail. This process was repeated until the sherbet was finished. On occasion I have been known to avoid the squeeze and tear down the paper as the level of the sherbet becomes out of reach. Job done and confection thoroughly enjoyed. That’s what I call and experience. Not wanting to appear too piggy I will be saving the new style Sherbet Fountain for tomorrow when I will snaffle it after lunch and compare the new experience to the old. Until then I will probably need to hide it to avoid the temptation of it’s contents (not packaging!). I too am a fan of the old sherbet fountain, and am appalled at its loss of classic packaging in favour of ‘health and safety gone mad’. So you never said whether the new packaging made any difference to the taste experience. Was the licorice fresher, as designed. Did you, even for one second, consider using the resealable lid?